Arizona's College and Career Competency Team Training is a free, two-year professional development training series sponsored by the Arizona Department of Education in conjunction with the University of Kansas Research Collaboration. 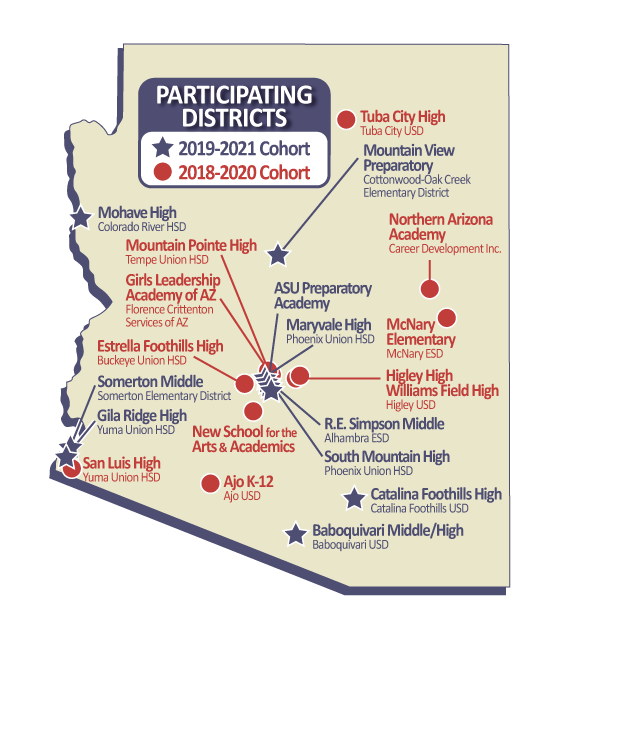 AZ CCCTT provides coaching and training to interdisciplinary teams from Arizona middle and high schools to systematically embed college & career competencies into core content (addressing standards and competencies simultaneously). AZ CCCTT equips educators with information on research-backed methods for consistently and meaningfully incorporating intrapersonal and interpersonal competencies into their daily instruction; research has shown that students who develop these competencies are more likely to graduate high school as career-equipped, lifelong learners who are socially and emotionally engaged. For more information about the project, read the College and Career Competency Team Training flyer. Through both face-to-face and virtual supports, Arizona CCCTT provides evidence-based research on the competencies, as well as coaching and support for teams to collaboratively create plans; identify, collect, and analyze relevant data; assess impact; and make adjustments to instruction as they embed competency development in their general education curriculum. Participating schools have noted a number of positive impacts of the program, including students' and teachers' increased awareness and understanding of the competencies, students' and teachers' increased acknowledgement of the importance of the competencies for success in college and careers, and students' increased application of and proficiency in the competencies. The application window is now OPEN for the 2019-2021 academic school year cohort! Teams will be selected on a first come, first served basis. Please click here to open and download the application form: 2019-2021 Application. You can also reach out to Dr. Jane Soukup (jsoukup@ku.edu) at the University of Kansas or Ana Núñez (Ana.Nunez@azed.gov) at the Arizona Department of Education.